SAPELE—A man sustained injuries from a tear-gas canister fired by security operatives in Sapele yesterday, as residents staged another protest against epileptic power supply in the town, this time to the Ogorode Power Generation Plant. 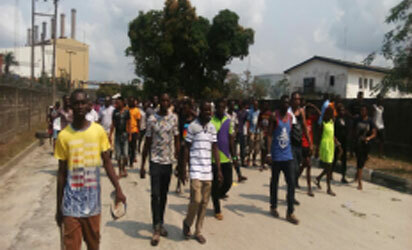 The residents, in their hundreds, moved early from Sapele’s Olympia Hall, marched several kilometres through Ogorode New Road to the gates of the power plant. Gabriel Eyide, a lawyer, who was among the protesters, told Vanguard: “We know the generating plant is not directly responsible for the daily blackout we suffer. But we came here today (yesterday) to let the world know our predicament. A management staff, who refused to reveal his identity, cautioned the crowd, saying it was not their place as a generation firm to address distribution issues. The crowd later dispersed at about noon, with many protesters eager to hold more rallies in the weeks ahead till relevant stakeholders agree to resolve the lingering issue. The clergy in Sapele, worried by the frustrations of residents over the lingering poor power supply, had earlier led a protest to the community’s base of the Benin Electricity Distributing Company, BEDC.